Owing to the rich industry experience, we are able to render Exhibition Event Branding Service. The Exhibition Event Branding Services provided by us are rendered within the specified period of time at budget friendly prices. These displays are highly acclaimed for their spacious and trendy designs. The stall displays are set up in case of exhibitions, expos and other similar events. These displays are convenient to set up and can be removed easily as well. We are counted amongst the foremost service providers, engaged in offering Event Branding Service at very affordable price to the clients. 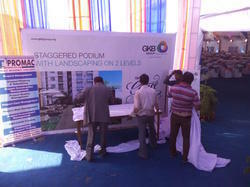 - We provide Event Props and Branding and Fabrication for Corporate Events in Kolkata and rest of West Bengal. - Backdrops, Side Wings, Projectors, Led Screens, Projectors, Manpower Supply, Hospitality Services, Light and Sound, Stage and Platform, etc. Banking on the understanding our personnel have received in the years, we are engrossed in the business of offering Events BrandingService to our clients. Credited due to their reasonable rates, these services are widely appreciated amongst our clients. More to this, our adroit workers are rendering these services in the most planned manner. You should be able to get your prospective customers to see you as the only one with a solution to their problems. Now THAT's what we at Studio Ogaan call Branding! Backed by our vast industry experience, we are offering Event Branding Services to our precious customers. The offered services are admired for their accuracy, attractive results, high efficiency, and perfection. Highly skilled professionals interact with our patrons to execute these offered services according to their needs. Entertaining your clients or board members and even your employees is important and what better way to do it, than serve them truly memorable food. We do corporate events & cocktails, board lunches & dinners as well as store openings & branch launches and can customize the food to match the theme of the event. By conducting some kinds of events we will promote your brands, so that it will reach huge number of audiences. On an everyday basis we are flooded with countless marketing messages - most of them we pick to overlook. Events as a marketing resource enable brands and companies to break through this barrier in an active, directed and calculable way. For a corporate organising a conference, it is of prime importance that all branding activities are coordinated and in conjunction with brand guidelines. And often, it is difficult to carry all your collateral with you to your destination.